The British swimmer won gold in 57 seconds at the European Championships on Saturday, shaving 0.13 off his previous best mark, which he swam at the Rio de Janeiro Games two years ago. 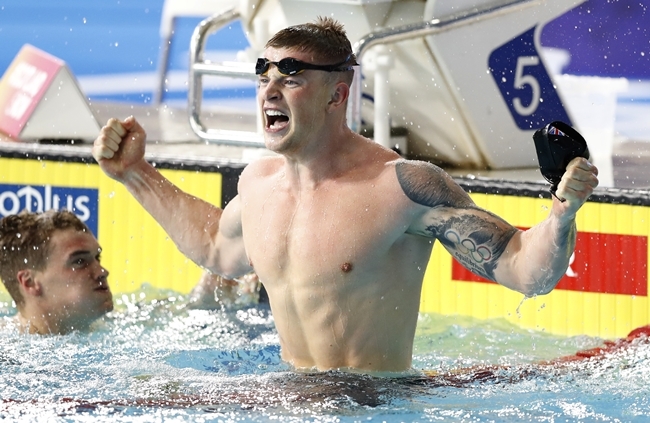 On the Gold Coast in April, he won the 100 breaststroke in only 58.84, and suffered a first defeat since 2014 in the 50 breaststroke, where he was edged by South Africa’s Cameron van der Burgh. “When you go four years without losing, you kind of get complacent even if you don’t want to admit it to yourself,” he said, adding that a “spider web of support” – his girlfriend, family, and coaches – helped him to rediscover his joy in the sport. An hour after Peaty’s achievement, Kliment Kolesnikov set a world record in the final of the men’s 50-meter backstroke. The Russian finished in 24 seconds to beat the previous best mark set by Britain’s Liam Tancock, who timed 24.04 at the 2009 world championships in Rome. It’s the 18-year-old Kolesnikov’s second gold medal of the European Championships after winning the 4×100 freestyle with the Russian team on Friday. He also won four European titles at the short-track championships in Copenhagen last year.